So, you feel you’re living frugally – not living lavishly or above your means. You’re really good at setting financial plans and achieving goals through budgeting, expect… sometimes you’re caught short. There is a better way! 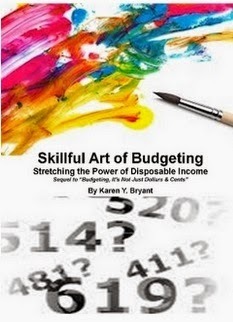 “Skillful Art of Budgeting” by Karen Y. Bryant will help you knock those budget shortfalls out for good to finally achieve your Financial Freedom. Tweak your living expenses without giving up what you really what, learn purchasing options and more to increase and strengthen your disposable income. Furthermore, you could analyze your spending habits to ensure your standard of living in every economic environment. Download your copy today!